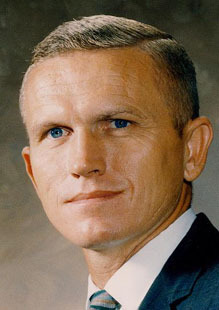 Commander of the 1968 Apollo 8 Mission, Frank Borman led the first team of astronauts to leave Earth's gravity and orbit the Moon. The Apollo 8 mission provided mankind's first close-up view of the lunar surface and of the dark side of the Moon. Previously, in 1965, Borman (and Jim Lovell) crewed Gemini 7 in the first Space Orbital Rendezvous, linking their craft with the Gemini 6 craft manned by Wally Schirra and Tom Stafford. On the same mission, Borman and Lovell became the first men to spend 14 continuous days in space. In 1967 Borman served on the Apollo 204 Fire Investigation Board (he been an assistant professor of thermodynamics and fluid dynamics at West Point), and later headed the team that re-engineered the Apollo spacecraft. During his time at NASA he also served as Field Director for the Space Station Task Force. In 1970 he retired from the Air Force in to work for Eastern Airlines, serving many years as CEO of the airline. He retired from Eastern in June of 1986. Borman later worked with the Patlex Corporation. He has also served as a Special Presidential Ambassador to nations of the Far East. He sought to raise support abroad for release of American P.O.W.s held by North Vietnam. Among Borman's many honors and awards are the the Congressional Space Medal of Honor and the National Geographic Society's Hubbard Medal. In 1990 he and fellow Apollo 8 crewmen Lovell and Anders were inducted into the International Aerospace Hall of Fame. Borman was inducted into the U.S. Astronaut Hall of Fame in 1993.